I first made these last Christmas for my Dad, though couldn’t blog them at the time as it would have given away the surprise! So I’m technically publishing these recipes a year late, but it’s definitely been worth the wait. The oils are delicious, and Dad was very pleased with them (they have been topped up more times than I can count, and last week I went round to make a fresh batch!). I bought two of these bottles from Amazon, and painted them using glass paints. I noticed recently that TK Maxx also have loads of lovely plain and decorated oil bottles in store, so you should check them out too! 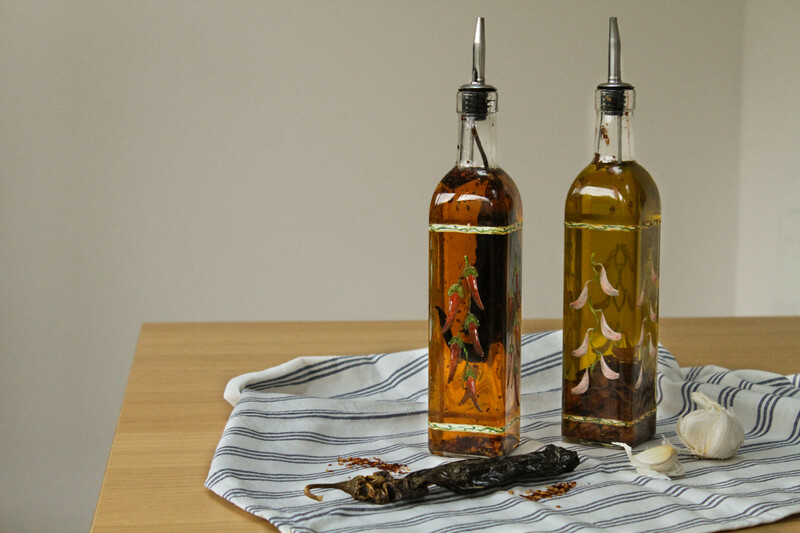 You’re also going to want a funnel to make transferring the oils to the bottles easier, and ensure you don’t waste any. You can use whichever chillies you like to flavour this, though they should be dried. I used pasilla chillies as I liked the description of the ‘rich, herbaceous dried fruit flavour’, but chipotle chillies would also be great. With this recipe it is really, really important that you use dried garlic, instead of fresh, to avoid the risk of botulism. 1. Pour about 100ml of the olive oil into a large saucepan along with the dried chilli or garlic flakes, and heat gently until the chilli/garlic begins to sizzle (don’t let them brown). 2. Add the rest of the oil and heat gently for about 10 minutes – do not boil! Turn off the heat (add the dried chilli flakes here, if using) and leave to cool to room temperature. 3. Thoroughly wash your oil bottles. Gradually increase the temperature of the water you’re using until it reaches boiling, then let the bottles drip dry completely. 4. 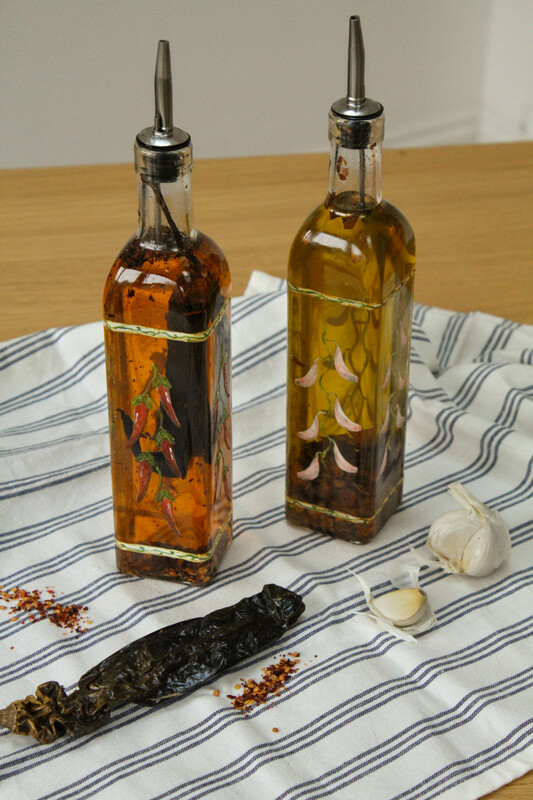 Use a funnel to pour the cool oil into the bottles (it’ll be easier to transfer the dried chilli/garlic flakes manually). Looking for other ideas for DIY Christmas gifts? 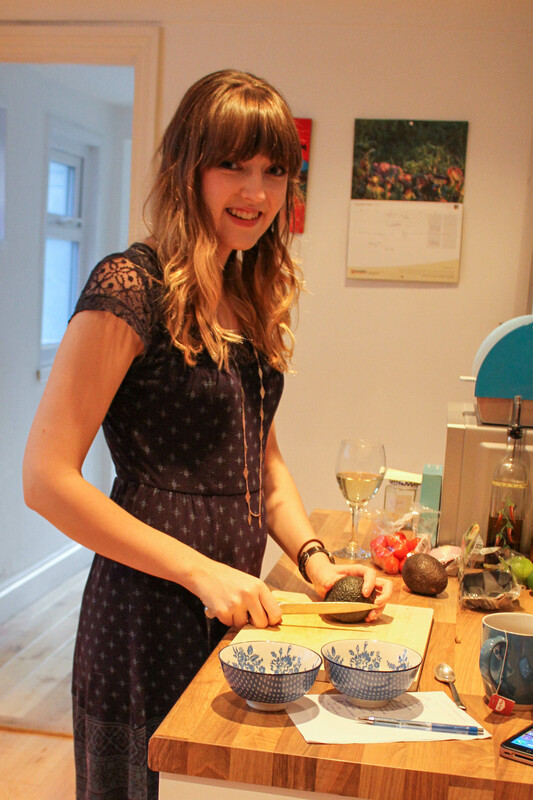 Check out my DIY mulled wine spice bags!